My inner voice is considerably more insightful than the one that comes out of my mouth. Throughout August, inny was adamant that I was fast running out of time. Opportunities to lay out under our huge whitebeam tree reading dozing were passing me by. I ignored the dopey wasps crawling over the window frames as I dashed about finding pencil tins and PE kits. I was certain the heavy green fruit of the Black Krim tomatoes in my veg beds would ripen gently in a warm September glow and I would breathe in the sweet rot of Autumn. Our beautiful summer seemed endless, but my subconscious had already noted the dropping leaves. Term began and the rain came. I haven't seen a single wasp in a fortnight, the toms are surely chutney. And I have completely run out of time. Now it's all timetables and lost property, alarm clocks and commuter traffic. But back in August I had a little fun with GBBO bread week - I just didn't get around to blogging it. The family demanded breadsticks so I obeyed. I am pretty scathing about the showstopper rounds, cooking doesn't need to be a spectacle - it needs to taste good. Heston has so much to answer for. I tried Paul Hollywood's green olive breadstick recipe from his How to Bake book. I made half the dough into a green olive mixture as directed and with the other half I experimented with roasted echalion shallot and Roquefort, because it's what I had in. The olive recipe called for 400g of olives which would have been ridiculous and expensive, so I halved it. I made the dough in the KitchenAid with a dough hook which was super easy. I was so carried away with the ease of the process I misread the bit about the dough trebling, and assumed a normal doubling would take place. I'm not sure whether it was the KitchenAid, the proportion of yeast, or the warm evening but the dough was very airy with an amazing cobwebby structure. Once shaped, the dough sticks require more proving. For this I would have needed five baking sheets and more than the tail end of the baking paper roll. As it was I spent the evening pinging back and forth from the kitchen in fifteen minute intervals, increasingly impatient, flinging bits of dough onto my single baking sheet while the oven belted out 250 degrees. Frankly it made very little difference whether the sticks were proved or not. They were all delicious hot out of the oven, the olive generally the favourite. They were sadly revolting after a day or two and I wouldn't bother making them again - at least a day old loaf can be toasted. And it only needs one tin. My inner/outer geek loves the lure of back to school. New shoes and sharp pencils, I always want to start something as September approaches. August is just too overripe and overgrown. 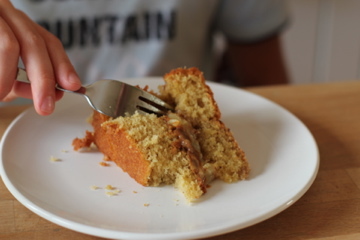 What better time to begin blogging again than a new series at of the Great British Bake Off? All the satisfaction of fresh challenge paired with the deep joy of autumn telly schedules. For the first episode, the family gathered round the set like it was 1983. GBBO is about the only regular programme we all watch together. 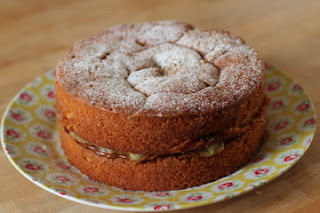 I knew immediately that I wanted to try a "signature bake" - a variant on a traditional Victoria sponge. I am obsessed with Germanic cakes, heavy with big pieces of fruit and topped with a nutty, crumbly streusel. I just can't get enough of them and imagined the top sponge with a crumble texture and a lovely apple filling through the middle. I started with a traditional small Victoria sponge batter (three eggs) but replaced a little of the flour with some whizzed up hazlenuts. I made a separate crumble mix of even quantities of Demerara sugar and plain flour with a little less melted butter and scattered it over one of the tins of batter. Then I chucked on a bit more pulverised hazlenut for the sheer hell of it. I was concerned that the crumble would sink into the sponge as it cooked and a halftime peek into the oven confirmed my suspicions. The only thing left on the surface were the nuts. Nuts. I forged on with filling. With one foxed chicken (poor Bella) and one broody chicken, wasting Sylvia's perfect little eggs on a cake mistake was not an option. A few Bramley windfalls from the orchard just needed to be heated with a squeeze of honey to make soft pulpy jam. A jar of Confiture de Lait winked at me from the fridge. It seemed like a cheat but the salty caramel was a perfect partner for apple and it was easy to spread on the warm sponge. The new kitchen has become as familiar as an old friend. It's simple lines are every bit as pleasing to work in as they are to look at. There are still finishing touches to be completed but as Winter drags it's weary, muddy boots all over Spring, I lack the energy for DIY projects. Or blogging! This morning's run in fierce cold and swirling snow drove me straight to the kitchen to chop and bake and prepare for some serious feasting. Tomorrow we will satiate our sharp hunger with roasted meats and glorious confections of egg, sugar and cocoa. As the children hunt their eggs in the garden, I will be searching for pink shoots of rhubarb, budding leaves and tiny Tête-à-tête narcissus to dress the table. Great British Bake Off. In all senses of the word. So this is to say I would have made teacakes this week. Mainly because I love their weird concoction of textures, the snap of the chocolate on your tip of teeth, then a deep sink into the mallow before reaching the disappointingly soggy crumb of the biscuit. Marks and Spencers make the best chocolate teacakes and I have no idea how many hundreds I have eaten in my lifetime, a lunchbox treat throughout my childhood. The main pleasure is in the dissecting. The pillow of marshmallow pulls away perfectly from the biscuit, with the chocolate still a perfect dome. This allows you to quickly consume the bland base, leaving you with a perfect mouthful of chocolatey marshmallow. If you are really feeling ritualistic you can then smooth the square foil wrapper between your fingertips and make an origami boat. 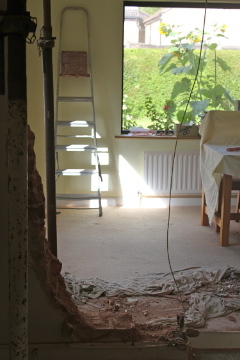 However, this is the black hole where my vile but functional kitchen stood until Monday. Most days I don't have any running water but I do have numerous random men wandering about the place. 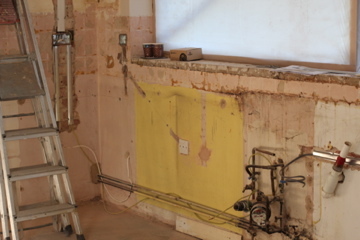 And this is the current temporary kitchen at the end of the sitting room. I am not sure I can temper chocolate under these conditions. A gingerbread construction might be easier, the mini oven is surprisingly good. I felt that the final challenge was crying out for an Eiffel Tower but I am sure it would end up looking as amateurish as theirs. I still bear the scar from an attempt to make a Christmas gingerbread house several years ago. Very hot caramel sears the flesh like molten lava. I think I have enough on my plate. After doing a quick bit of googling, Saffron buns seemed tempting. I liked the idea of the warmth of the spice combined with a rich dough. I found lots of recipes for the traditional Cornish cake and also some for a Swedish bun called Lussekatt (Lucia's Cat) which are traditionally baked on the 13th December to celebrate the Saint Lucia. This feast day falls near the shortest day and is celebrated by Catholic, Anglican, Lutheran and Orthodox Christians. The Swedish buns are simply an enriched saffron dough decorated with a few raisins before baking, but I desired more fruit and some citrus flavour too. My buns with candied peel are the resulting love child of a Cornish and Scandinavian dalliance. Delicious! Warm the milk and add the saffron. Stir and leave to infuse for 20 minutes. Rub the butter into the flour until it looks like breadcrumbs, then stir in the sugar, salt and yeast. Don't let the salt sit directly on the yeast or it will kill it; stir each ingredient in separately. Mix in the fruit then add the milk and egg to form a dough. Knead the dough for about 10 mins and then leave to rise for one hour or so, by which time it should have doubled in size. Divide the dough into 10 equal pieces. As ridiculous as it seems, I do bother weighing the whole mass and then each piece at this stage to get even sized buns. Roll each ball between your palms, stretching it evenly until it is 20-25cm long. Join the two ends together and twist the dough to make a figure of eight. Wriggle your shape so the join is in the centre and on the underside of the shape. Place the buns a few centimeters apart on a tray covered in baking paper and stud each loop with an extra raisin. Leave to rise for 45 mins. Eggwash, then bake at 200c for 12-15 mins. The buns are ready when golden brown. They should make a hollow sound when you tap the underneath. The saffron came through very well and the dough was light and springy. We all felt these were quite plain and would have been more festive with a little icing. I saw a frosting recipe recently which was a mix of soft cheese, icing sugar and milk. I think that would be lovely here, perhaps with a little orange juice or zest. Yesterday was rain, walls coming down and a favourite glass jar broken on the floor. Today is peace, hot coffee and Grasmere gingerbread crumbs on the lips. No hesitation this week, I had to make Queen of Puddings. I have only tasted this dish once before and I remember eating it so vividly. My parents were away on holiday and my maternal grandparents, Nanny and Grandad were looking after me and my brother. I think I would have been 10 or 11 years old. We were sat in our usual places at the table, me facing the kitchen and my brother opposite me. Nanny produced a large Pyrex dish, with visible layers of golden meringue, raspberry jam and a mellow yellow custard that was definitely not Birds. The flavours exploded in my mouth, hot and sweet and soothing all at once. It stayed warm in my belly long after I had gone to bed. I felt confident about this bake. The egg custard was the only element of the recipe I hadn't cooked before, so I started with that. A pint of full fat milk is warmed with butter, infused with lemon zest and sweetened. 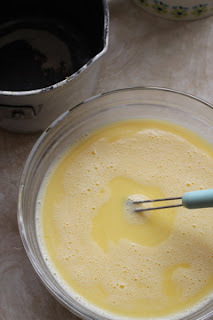 This is then whisked into three egg yolks, poured over breadcrumbs in pie dish and the resulting mixture is baked in a moderate oven in a bain marie until set. The next layer is a soft fruit jam which could be any combination of berries but I used a 50/50 mix of strawberries and raspberries. I wanted that ruby red colour and the simplicity of the two flavours. I do use a sugar thermometer - unlike Brendan, I really don't find it easy to judge the set by eye. Stupidly I wasted time piping the meringue on as Mary's recipe directed. 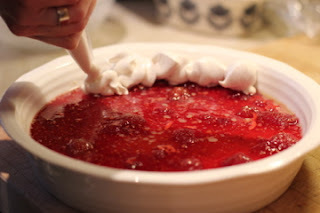 My dish was too wide and the meringue didn't cover the jam layer if piped so I ended up forking it across. I think I prefer it that way, my mum would always fork the top of her legendary Lemon Meringue pie. It makes for very crunchy ridges and no need for poncey piping bags. 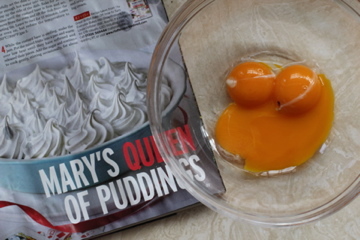 My Queen of Puddings looked lovely and it was a big hit with one of my testers. All the flavours I remembered were there but on my adult palate the effect was tooth shattering sweetness. 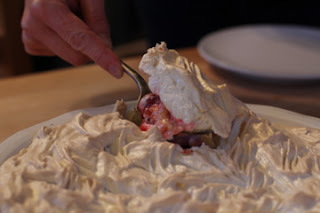 I think my custard split when cooking the meringue, it was watery when hot but I really enjoyed the pudding cold the next day when the custard had re-set. My ancient oven has been limping along without a working fan recently. If the builders turn up the whole kitchen may well be demolished next week to make way for something new and shiny. I have ordered a Russell Hobbs Mini Kitchen so I am hoping to carry on baking. It has a fan oven and two hotplates. I keep telling myself it's going to be FUN, like camping.